Many diamonds have imperfections not visible to the naked eye. ■ Carat is a weight measurement. A 1-carat diamond weighs 200 milligrams. But there’s no ideal size for a diamond. It depends on your budget and taste. Small diamonds are cheaper than large diamonds. A ring with three small diamonds totaling 1 carat costs less than a single 1-carat stone of similar quality. ■ Color is graded by letter, starting with D for rare, colorless diamonds. E and F are considered excellent, but G or H diamonds will look just as good to the naked eye. Down the scale, you’ll notice differences. ‘‘If you put a K color beside a G color, you’ll notice more yellow in the K,’’ said Russell Shor, of the Gemological Institute. ■ Clarity measures diamond flaws, called inclusions, which might appear as tiny spots, clouds, or cavities. SI stands for ‘‘slightly included.’’ VS is a better grade, ‘‘very slightly included.’’ VVS is even higher, ‘‘very, very slightly included.’’ Most inclusions in the VVS-SI range cannot be seen by the untrained eye ‘‘unless someone tells you where it is,’’ Shor said. ■ Cut measures workmanship, not a diamond’s inherent qualities. The way a stone is cut enhances sparkle and luminosity and can hide flaws. The best cut rating, ideal, is rare. After choosing the cut, ‘‘balance the color, clarity, and carat weight based on your personal preference to find the best diamond for you and your budget,’’ said Amanda Gizzi, of Jewelers of America. For example, for $2,000, you might pick a 1-carat, K-color stone with a slight inclusion, or a half-carat, G-color, with a very slight inclusion. An L or M-colored diamond at that price ‘‘will get you a 2-carat honker, but you’ll definitely notice the yellow,’’ Shor said. It’s easy to compare options online. At BlueNile.com, set your price range then play with carat size and the other C’s to see tradeoffs. Many websites list the four C’s for every ring they sell. Brick-and-mortar stores should be able to provide grading reports, whether from GIA or another expert lab. Diamonds can be cut into many shapes. Round offers ‘‘the biggest bang for your buck because the difference between the raw and cut diamond is smaller,’’ Colgan said. But unusual shapes with retro looks and names like Asscher and pear are having a resurgence. Many major brands sell diamonds online and in stores. Some retailers sell online only. Gemvara.com’s site is fun for customizing designs. Just click to see how a ring looks with diamonds and sapphires, versus diamonds and rubies, or with white versus yellow gold. Blue Nile has sold engagement rings to 325,000 couples over the Internet, including one for $1.5 million. Nervous about size? Blue Nile will mail a free plastic ring-sizer with no obligation to buy. Blue Nile also has a 30-day return policy, no questions asked. Many retail stores offer 30-day returns with no penalty. That’s important for surprise proposals in case the bride to be says no, or if she says yes but wants a different ring. These days, though, couples often shop together for a ring. Some customers prefer online shopping so they won’t be pressured by a sales person. But most diamond rings are bought in person, according to Jewelers of America. People want to see and touch before buying. Ocappi.com offers to bridge the gap between in-person and online shopping by mailing out ‘‘try on rings’’ made from silver and cubic zirconia. The replica rings let you see how different styles, shapes, and carats look on your finger. You can order up to six replicas at once. As long as you return them, there’s no charge and no obligation. Ocappi pays for shipping. Some buyers prefer brands they know and trust, whether Macy’s or Tiffany. Others want to go local. For an intense shopping experience, try Manhattan’s diamond district on 47th Street between Fifth and Sixth avenues. It can be intimidating: Salesmen literally stand on the street. But if you’ve done your homework, it can be fun. In 2011, a 33.19-carat diamond owned by Elizabeth Taylor sold for $8.8 million. The same stone was $305,000 in 1968. But that’s an exception: The average diamond does not appreciate much, if at all. ‘‘A diamond will never become worthless, but I would not buy a stone for $1,200 thinking I’m going to get $2,000 back for it at some point,’’ Shor said. Does that mean estate-sale rings are a bargain? 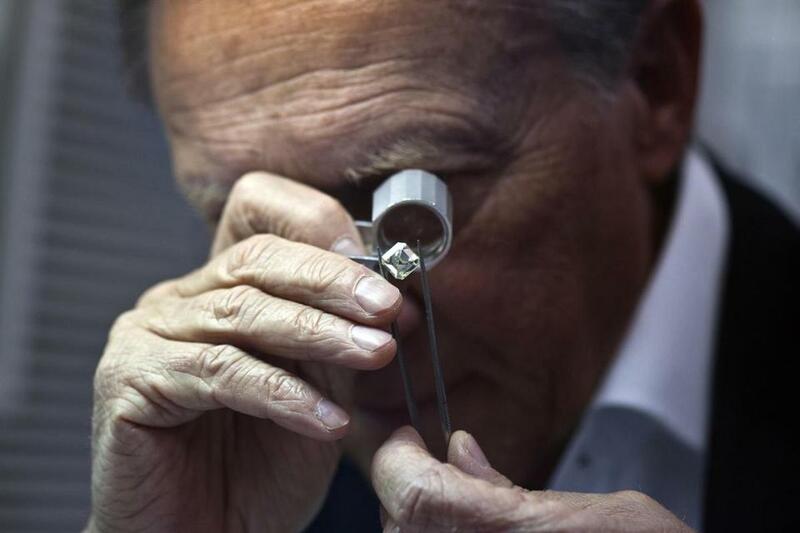 Shor says ‘‘older stones can be a bargain,’’ but cautions that stone-cutting has improved with computers and robotics, so older rings may not have ‘‘the quality of workmanship’’ found in modern diamonds. It’s also a matter of taste.